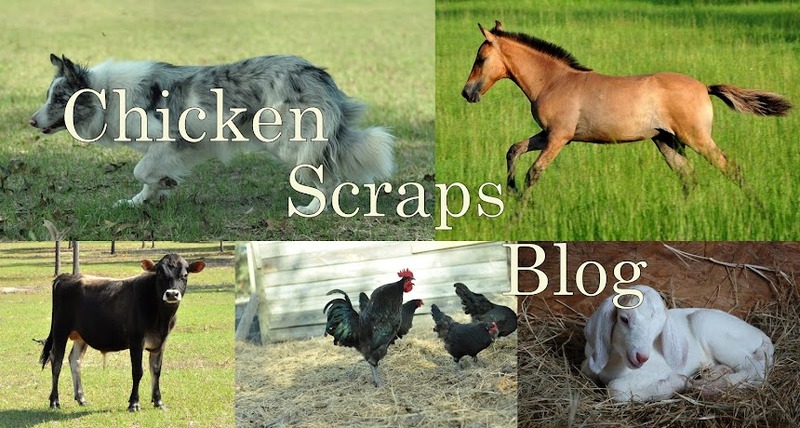 Here are a few of the animals on our farm. They pull their weight, and are an important part of our farm ecosystem, and are also treasured pets. We have two cows, both AJCA registered Jerseys. 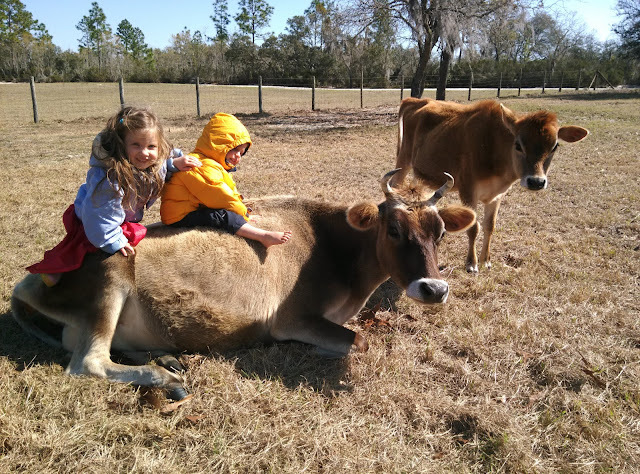 Blossom is our family milk cow. She is a good producer, giving between 2 and 3 gallons in the early part of her lactations, and then after two or three months leveling off to around 1 1/2 to 1 gallon per day. Since we don't feed any grain at all to our cows, this is pretty good. She is also very good-tempered, and is an excellent mother. She is currently in her second freshening. She also has a very nice perfectly even udder that is very strong and well attached. Buttercup is Blossom's heifer calf from her second freshening. She is polled (naturally hornless), and is very good tempered. She freshened with her first calf on 12/29/2015. Buttercup peaked at 2 gallons per day; not bad for a first freshener, in the middle of winter, without grain. 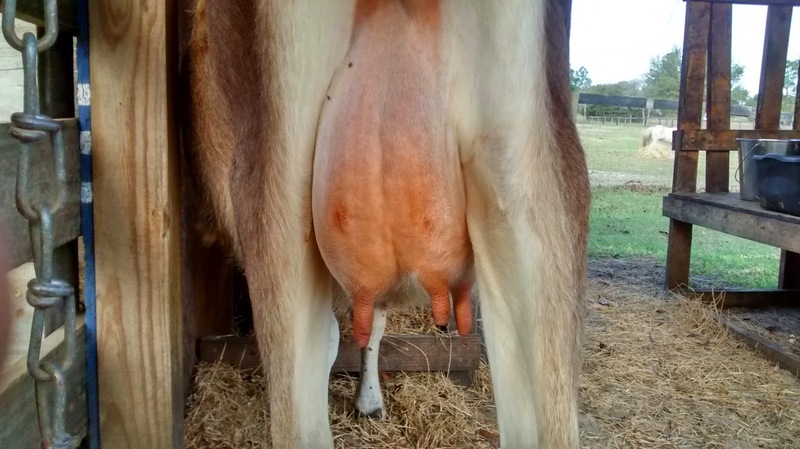 She has a beautiful udder, and is very easy to milk. I trained her to milk tied to a post in the pasture, and she gave me very little trouble, taking to the milking routine like a duck to water. Her milk, like Blossom's, is rich and creamy. William's first time milking Buttercup. Flavia- Chief mouse, rat, squirrel and rabbit catcher. Love your farm, great information, and humor. Thanks for taking the time to create such a wonderful page. Cathy, 5 acres in Lady Lake. Thank you for commenting! I'm glad you like it! Love the farm, it is the plan for my family. Hope one day to have something similiar, the 5 year old boy loves our small vegetable garden and talks all the time about chickens. Inspiring to see someone in the area with what I am looking for.